JYP Entertainment (엔터테인먼트) decided to hold auditions in New York City today to watch hundreds of aspiring teens fight for a chance to become a star. 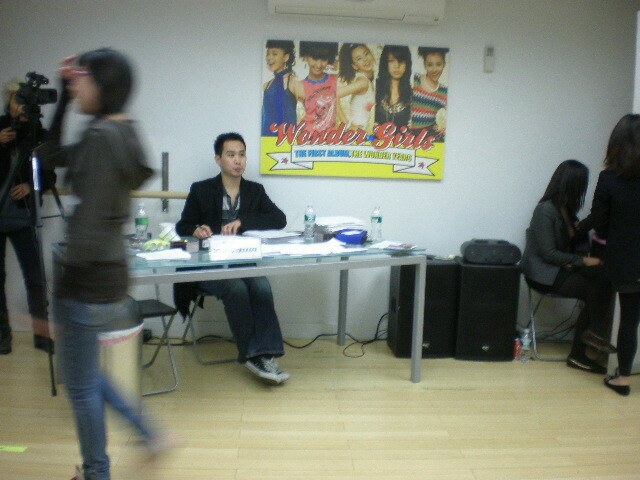 This talent agency is the home of Korean artists such as the Wonder Girls, 2PM, and 2AM. In order to wow the judges, people have to demonstrate their talent through their skills in singing, dancing, acting, or modeling. OK, enough about that. My friend told me about the auditions a few weeks ago, and I didn’t really think I would go. It wasn’t until this last week that I thought to myself, “Why not? It would be a fun experience.” Because I felt so laidback about it, I didn’t even prepare a song to sing. Becoming a finalist wasn’t really a goal in my head. Truly, I was just there to see what all the hoopla was about, since I’ve heard quite a few people in my school talk about it. Finding the place wasn’t too difficult. We immediately recognized the place by the long line of Asians that trailed in front of the door. (No racist! 99% of the people in line was literally Asian!) My sisters, my friends, and I registered, and I was #632. The ones who were standing next to the door, waiting to enter, were in the mid-500s, so we were still a long way off. All this time waiting, I definitely wasn’t nervous. My biggest concern was that I still didn’t have a song yet. Long story short, I ended up singing “You Belong with Me” by Taylor Swift because my sister thought I should. I…sucked…so…much. Unfortunately, right before I came up to sing, the nervousness kicked in, and I completely choked. I started in the wrong key, and I forgot the lyrics. Everything just fell apart. The judge was kind; he made only a small gesture when he wanted the person to pretty much stop wasting his time. No rude scoffs or remarks. I was a little bummed afterwards, but I just kept reminding myself, “It was all for fun, remember?” I just laughed it off, even though I wished everything turned out perfectly. A random invitation to see the Wonder Girls in Garden State Plaza. An almost empty gas tank. So, we went to Newark (which is nearer) to get a Cuban sandwich from this place that our Calculus teacher always talked about in class. The sandwich was very good, so I think we’re going to start asking our teacher for food recommendations. Then, my friends came over and jammed at home. It’s nice to have friends who sing. It’s nicer if one of them plays the guitar.